Chinese Farmers Ordered to Plant More Soybeans, Become Less Reliant on U.S.
One central Chinese province has ordered its farmers to more than double their soybean acreage, amid a trade dispute with the U.S. and Beijing’s push to reduce reliance on exports. The agriculture department of Henan, which lies about 450 miles southwest of Beijing, said on its website Wednesday it will “actively guide” farmers to expand the soybean planting area by 500,000 mu (82,370 acres). The province had 300,000 mu dedicated to soybeans as of June 1, the provincial government said. “China’s policy in 2017 had shifted toward encouraging soybean acreage [for 2018] instead of corn,” said Rich Nelson, director of research at Allendale, an agricultural market research and trading firm. 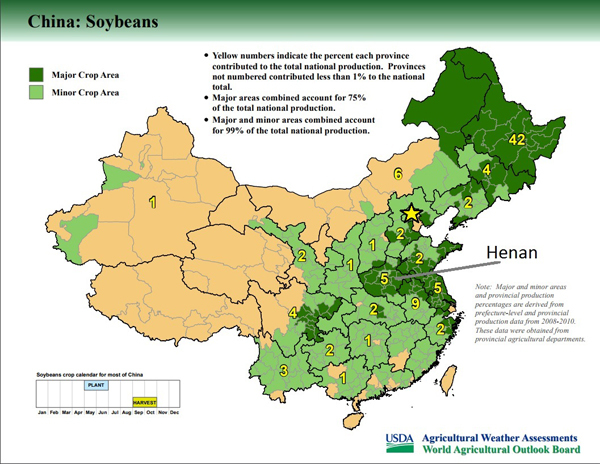 China is the world’s largest consumer of soybeans and the destination for well over half of U.S. soybeans. In April, Beijing threatened tariffs on U.S. soybeans and other products in retaliation against the Trump administration’s proposed duties on $50 billion worth of Chinese goods. The two countries are still in negotiations. In the meantime, China’s agriculture ministry forecast in May that the country will cut its imports of soybeans in the 2018-2019 marketing year for the first time in 15 years. Soybean acreage is set to increase 7.8 percent to roughly 21 million acres, the ministry said, according to a Reuters report. That follows this year’s growth of 9.8 percent, the U.S. Department of Agriculture Foreign Agricultural Service said in an August 2017 report. The agency also noted that Heilongjiang, China’s largest soybean-producing province, increased its acreage for the crop by 15.8 percent to its largest since 2011. Soybean futures fell 2 percent Thursday to their lowest since February, after overall export sales disappointed. Poor weather has also weighed on prices, Nelson said.